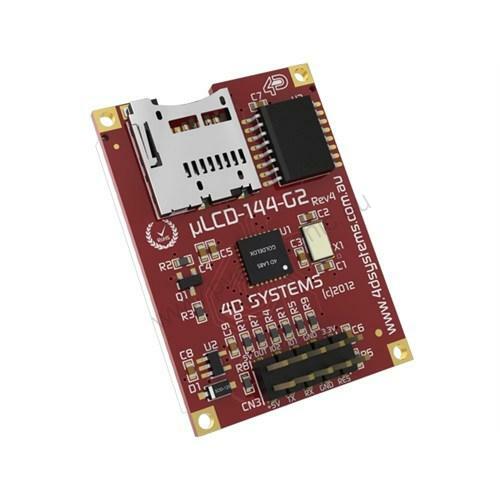 The uLCD-144-G2 is a 1,44-inch LCD TFT display module, 128x128 pixel resolution, 65,000 colors with embedded GOLDELOX graphics processor. The module can be programmed in its native 4DGL language (similar to C) providing stand-alone functionality, or it can be configured to be serial slave device for use with your favorite host controller. 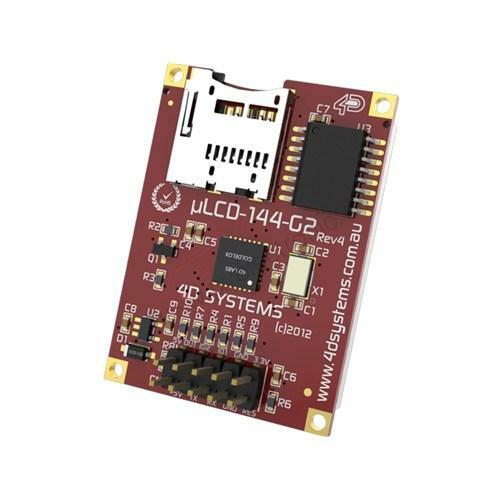 uLCD-144-G2 main features: - 1,44-inch 128x128 pixel LCD TFT screen with 65,000 colors. - LED back lighting with greater than 150° viewing angle. - UART interface to external devices. - Powered by GOLDELOX graphics processor. - 2 x GPIO ports supports: Digital I/O A/D converter with 8/10 bit resolution Complex sound generation Dedicated RTTTL tune engine Multi-Switch Joystick Dallas 1-Wire - 10K bytes of flash memory for user code storage. - 510 bytes of RAM for user variables. - Serial TTL interface with auto-baud feature (300 to 600K baud). - On-board micro-SD memory card slot for storage. - Comprehensive set of built in high level 4DGL graphics functions and algorithms. - Supports all available Windows fonts and characters. - 4.0V to 5.5V range operation. - Size: Display size: 43 x 31 x 6.4mm. Active Display Area: 25.5mm x 26.5mm. Module dimensions: 43 x 31 x 13.7mm. - Weight: ~ 10g. - 4 x Mounting Holes with 2.0mm diameter for mechanical mounting. - RoHS Compliant. 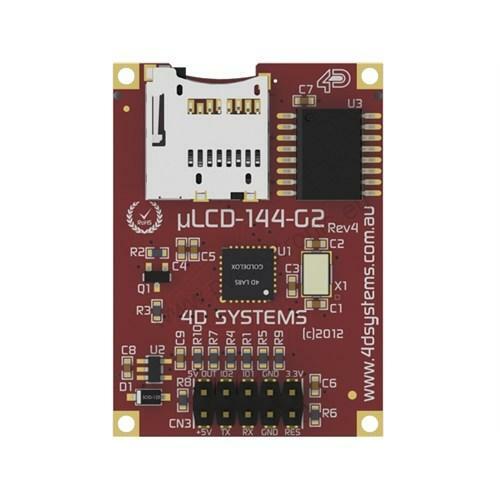 What's in the box: - uLCD-144-G2 Display Module - 150mm 5-way female to female jumper cable for quick connection to another device or breadboard. - 5-way male to male adaptor. - Quick Start Guide. Software Tools The Module is programmed using free Workshop 4 IDE. The IDE includes an Editor, Compiler, Linker and Downloader to develop complete 4DGL application code. All user application code is developed within the Workshop 4 IDE. The IDE includes four development environments: Designer Environment The Designer environment enables the user to write 4DGL code in its natural form to program the display module. ViSi Environment A visual programming mode that enables drag-and-drop type placement of objects to assist with 4DGL code generation. ViSi allows the user to visualize how the display will look while being developed. ViSi-Genie Environment The Visi-Genie environment does not require any 4DGL coding at all. All code generation is done automatically. The user can simply create the display layout with the desired objects (similar to ViSi), set the events to drive them and the code is written automatically. (Only available for Picaso) Serial Environment The Serial Environment gives the option to transform the display module into a slave serial display module. This allows the user to control the display from any host microcontroller or device with a serial port. NOTE All programming of the module should only be carried out using the 4D Programming Cable or uUSB-PA5. Any malfunction because of custom or third party USB to Serial converters or Serial (RS232) to Serial (TTL) level converters will void the warranty.